Mr Guterres, 67, was the "clear favourite", Russia's UN ambassador Vitaly Churkin announced on Wednesday. An engineer by trade, Mr Guterres first entered into politics in 1976 in Portugal's first democratic election after the "Carnation revolution" that ended five decades of dictatorship. He quickly rose in the ranks, becoming leader of the Socialist party in 1992 and was elected prime minister in 1995. As head of the UNHCR refugee agency from 2005 to 2015, Mr Guterres led the agency through some of the world's worst refugee crises, including Syria, Afghanistan, Iraq. During that time, he repeatedly appealed to Western states to do more to help refugees fleeing the conflicts. 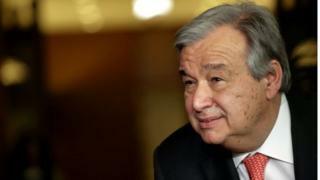 Former Portuguese President Anibal Cavaco Silva said earlier this year that Mr Guterres had "left a legacy" at the refugee agency "that means today he is a respected voice and all the world listens to him", according to the AFP news agency. Russia's ambassador and current head of the UN Security Council, Vitaly Churkin, said all the candidates had "a lot of wisdom, understanding and concern for the fate of the world," but "we have a clear favourite, and his name is Antonio Guterres". There was some disappointment among campaigners who had hoped for a first female secretary general, or a candidate from Eastern Europe - which has never held the position. But the process was "remarkably" uncontroversial, said Samantha Power, the US representative to the UN. "In the end, there was just a candidate whose experience, vision, and versatility across a range of areas proved compelling," she said, adding that the process involved more scrutiny than ever before. "People united around a person who impressed throughout the process." The UK's Matthew Rycroft said Mr Guterres "will take the United Nations to the next level in terms of leadership" and be "a moral authority at a time when the world is divided on issues." UN secretary general: The hardest job in the world? Who were the other contenders? In the end, the highest-placed woman, Irina Bokova, came fourth. Serbian candidate Vuk Jeremic, a former president of the UN General Assembly, came second, followed by Slovakia's Miroslav Lajcak. The 15-member Security Council cast secret ballots for each of the 10 candidates on Wednesday and none were found to oppose Mr Guterres. They were asked to select from a choice of 'encourage', 'discourage' or 'no opinion' for each candidate, with the former Portuguese prime minister receiving 13 'encourage' votes and two 'no opinion' votes. He beat nine other candidates, including EU budget commissioner Kristalina Georgieva from Bulgaria, to become the next UN chief. His nomination came despite a concerted effort to appoint the UN's first female secretary general. A formal vote will take place at 10:00 EST (15:00 BST) on Thursday to recommend Mr Guterres to the UN General Assembly, which must approve his nomination. In January 2017, Mr Ban will stand down after 10 years at the helm. What does a UN secretary general do? The Security Council - with five of its members wielding vetos - is the most powerful body in the UN. While not as powerful, the secretary general serves as the organisation's top diplomat and chief "administrative officer". It has been described as the most impossible job in the world, says the BBC's diplomatic correspondent James Landale. The secretary general of the United Nations has to run an unwieldy bureaucracy and manage the competing demands of the world's big powers, he adds. A key requisite of the role is to step in both publicly and privately to prevent international disputes from escalating. The post lasts for five years but is limited to a maximum of two terms.